Zebrafish (Danio rerio) has served as a promising fish model in various studies that includes genetics, developmental biology and therapeutic drugs development [1, 2]. In genetics of development, this model was exploited to study genes which control the development of specific organs [2-6]. Genes such as wnt, wnt9a, sonic hedgehog (Shh) and transcription factor AP-2 (Tfap2) are required for facial morphology as well as palate and lower jaw development . It has been demonstrated that deficient in the expression of some genes in zebrafish mutants have been linked to some respective human diseases [2, 3, 6]. Zebrafish embryo has also been a very useful model to examine any possible developmental toxicity effects of many chemicals in which its organogenesis is completed within the first 48 h of development [3-5]. However, craniofacial bones and skeleton of a zebrafish only developed at about days-post-fertilization (dpf) . Prior and recent analysis of craniofacial features of zebrafish such as sutures, cartilage, middle ear, palate, jaw and bone differentiation has increased the understanding about craniofacial development and skeletal biology in the zebrafish [5-9]. Proteins (i.e., SOX, Alx1) and deubiquitinases are important for craniofacial development (i.e., branchial arches and ethmoid plate) and regulate the cranial neural crest (CNC) cells differentiation/migration into the frontonasal primordial [9-11]. Hormones such as estrogen can affect the cartilage development of zebrafish embryo and displayed irregular craniofacial bone structure with significant craniofacial bone degradation . Zebrafish embryo as a toxicological model as compared to higher vertebrate species offer great advantages in regards to their size, husbandry, and early morphology [2-5]. Small size molecules showed no difference on toxicological effect of zebrafish regardless of the presence or absence of chorion [3-5]. Compared to other fish species, matured zebrafish are about 3 cm long, thus reduces housing space and husbandry costs [1-3]. Besides their small size, zebrafish is very practical because of their high fecundity and transparent embryos [6-9]. Matured zebrafish can lay eggs every 5 to 7 days up to 300, thus allowing the use of high-throughput screening of potentially toxic compounds [1-3]. Despite of many endpoints studied for developmental toxicity study such as cardiovascular function, hatching rate, heart-beat rate, body length measurement, body shape, tail cellularity and other organs function, this current article attempt to review on the effect to chemical toxicants on craniofacial structures of a zebrafish embryo [7-9]. Recent research activity has been devoted to study the effect of various chemical compounds on craniofacial development of a zebrafish including compounds such as warfarin, acetaldehyde, penicillin G, retinol, hydrocortisone, retinoic acid and acrylamide [7-10, 12-15]. Facial malformation is related to deformation of cartilage, bone, and tooth position during embryonic development. These chemical may interfere with the expression of certain proteins such as Forkhead-domain transcription factors (Fox) and Sox9a which has been recently identified important for cartilage development (i.e., morphogenesis and differentiation) and allow cell progenitors to form cartilage and teeth in the face . Hence, in this review, recent study on craniofacial development of a zebrafish is described with focus of discussion related to the effect of chemical pollutants to the craniofacial development of a zebrafish embryo. 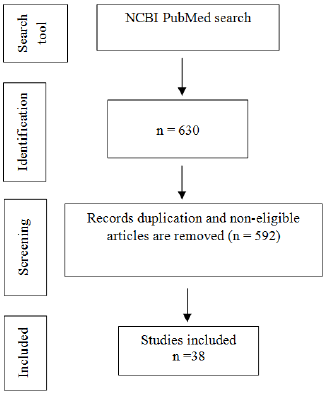 Searches were performed using NCBI PubMed and NCBI PubMed Central. These databases provide coverage of high-quality, peer-reviewed articles and patents in the fields of zebrafish pigmentation. Searches were performed from January 2018 to November 2018 and articles published after 1995 were selected for review. Terms and keywords relating to “zebrafish” and “Craniofacial” or “toxic” and “developmental toxicity” were used in the searches. Searches in NCBI PubMed resulted in 630 articles and the contents were reviewed. In this review, the articles referred must be related to zebrafish craniofacial developmental studies. Studies that did not meet the inclusion criteria were excluded. In total, 592 studies were excluded as their abstracts do not significantly relate to zebrafish and craniofacial. The full texts of the remaining 38 studies were reviewed. A final total of 38 articles were selected for inclusion in this review. The process of article selection is featured in Figure 1. Figure 1: Flow chart showing the process of selecting the relevant studies for the systematic review. Table 1: Chemical compounds and their chemical property and effect on craniofacial development of a zebrafish embryo. Because of the universal utilisation of various chemical in crops and agricultural products, many herbicides, pesticides and fungicides are widely discharged in environmental soil and water, which may cause pollution and pose a serious threat not only to aquatic life and ecosystem but also to human [11, 16, 17, 23, 24, 29]. Recent study demonstrated that atrazine (C8H14ClN5) at concentration of more than 1 µM caused craniofacial defects which may be related to delayed vertebrae mineralization as well as malformation to the development of cartilage and bone of a zebrafish embryo . Other chemical compounds such as bisphenol A (C15H16O2) and its analogues at concentration of 1.0 to 200 mg/L has shown craniofacial deformities to zebrafish embryo which related to their estrogenic mechanism . In comparison, embryo exposed to the encapsulated pyrethroid-lambda-cyhalothrin formulation at concentration of greater than 20 ?g/L experienced craniofacial malformations as well as deformation of body morphology and development of pericardial edema . Moreover, pyrethroid ester such as deltamethrin (C22H19Br2NO3) at a concentration dependent manner resulted in misexpression of some gene such as sonic hedgehog (shh) which later leads to phenotypic deformation with reduced eyes size and larger head to body ratio . Some other effect of severe craniofacial phenotypic defect can be observed to delayed formation of the scleral ossicles within the eye, reduced eyes size, deformed jaws as well as reduced craniofacial bones with abnormal skull shape [23, 24]. On the other hand, zebrafish embryo exposure to triadimefon (C14H16ClN3O2) developed craniofacial and pharyngeal arches defects in a concentration dependent manner which prominent defect can be observed at concentration of greater than 4 ug/mL [16, 17]. Pharyngeal arches are transient multifaceted embryonic structures positioned next to the eye and below the ear. These defects lead to significant loss of forebrain-midbrain structure with reduced sized and flattened forebrain . Another triazole fungicide such as paclobutrazol (C15H20ClN3O) negatively affects craniofacial cartilage formation in zebrafish embryo . In a study, selenium containing compounds such as selenate and selenite which may potentially leach from agriculture and mining site did not produce any craniofacial malformation in zebrafish embryo at concentration tested . Nevertheless, L-selenomethionine (C5H11NO2Se) showed significant abnormality and deformation to some part of zebrafish embryo structure . Another study showed that a well-known toxicant 2, 3, 7, 8- tetrachlorodibenzo-p-dioxin (C12H4Cl4O2) promote the expression of FoxQ1b gene which suggested to play part in abnormalities of jaw primordium and craniofacial structure . The 2, 3, 7, 8-tetrachlorodibenzo-p-dioxin has been also linked to reduction of sox9b expression in zebrafish embryo which leads to developmental jaws deformation . The smaller jaw size is due to a decrease in both the size and number of chondrocytes in the developing craniofacial cartilages [26, 27]. Other effect of 2, 3, 7, 8-tetrachlorodibenzo-p-dioxin includes reduce ossification of osteoblasts in the perichondrium of craniofacial cartilages and disrupt dermal-perichondrial bone growth of the craniofacial skeleton in the zebrafish larvae [25-28, 31]. Polychlorinated biphenyls such as non-ortho polychlorinated biphenyl 126, mono-ortho polychlorinated biphenyl 28 and di-ortho polychlorinated biphenyl 153 showed craniofacial malformations (double head, triple retina) in a concentration-dependent manner . In comparison, polycyclic aromatic hydrocarbons (PAHs) such as pyrene, dibenzothiophene or phenanthrene reduced the size of the jaw and affect other craniofacial skeleton structures of zebrafish embryo . Nitrite treatment at 1, 000 mg/L and hydroxylated polybrominated diphenyl ethers at concentration greater than 50 nM on zebrafish embryo caused craniofacial malformation, decrease in head trunk angle, lower jaw deformities and craniofacial cartilage malformations [32, 33]. Several attempts have been made to correlate findings on the effect of toxicants in zebrafish embryo to higher vertebrate organisms (i.e., rodents, Xenopus). For instance, triadimefon and cyproconazole administrated at 300 mg/kg and 20 mg/kg daily respectively to rats showed severe craniofacial, axial skeletal malformations and abnormal buildup of cerebrospinal fluid (CSF) in the brain of rat embryos [16, 17]. Pyriproxyfen, at concentration of more than 5000 mg/kg daily caused health problems to mammalian models (i.e., mice, rats and dogs) while at concentration of 5.2 ?M renewed daily resulted craniofacial defect in zebrafish embryo . The application of zebrafish embryo has been extended to pharmacotoxicology studies such as ketamine, topiramate, ethanol, retinoic acid, folic acid, phenylthiourea, methimazole, warfarin, acetaldehyde, penicillin G, retinol, hydrocortisone and acrylamide [35-38]. Ketamine, an anesthetic drug caused defects in cartilage and bone elements of an abnormal craniofacial structure of zebrafish embryo . Topiramate, a epilepsy-treatment drug caused cartilage deformation in the craniofacial area of zebrafish embryo, particularly with significant absence of ceratobranchial cartilages and developmental malformation to ethmoid plate, ceratohyal and Meckel’s cartilage [36- 38]. In summary, several chemical and organic compounds from insecticides and herbicides, such as pyrethroids, triadimefon, 2, 3, 7, 8-tetrachlorodibenzo-p-dioxin, organophosphates, neonicotinoids have the potential adverse effect on craniofacial structure of zebrafish embryo. Despite relevant application of zebrafish model to study the effect of developmental toxicants to aquatic life, this model is also a useful experimental tool which provides an excellent alternative to a mammalian model in the future. Many other studies also demonstrated that these toxicants are apparently harmful to mammalian and human. Therefore, findings that have been demonstrated using zebrafish embryo may serve as a guideline for appropriate action to be taken into consideration to ensure the standard quality of the aquatic environment and protect human health. Pengfei Xu, Bartosz Balczerski, Amanda Ciozda, Kristin Louie, Veronika Oralova, Ann Huysseune, J. Gage Crump (2018). Fox proteins are modular competency factors for facial cartilage and tooth specification. Development : dev.165498. doi: 10.1242/dev.165498. Mork, L., & Crump, G. (2015). Zebrafish craniofacial development: a window into early patterning. Current topics in developmental biology, 115, 235-269. Doi: 10.1016/bs.ctdb.2015.07.001. Curtin, E., Hickey, G., Kamel, G., Davidson, A. J., & Liao, E. C. (2011). Zebrafish wnt9a is expressed in pharyngeal ectoderm and is required for palate and lower jaw development. Mechanisms of development, 128(1-2), 104-115. Kamel, G., Hoyos, T., Rochard, L., Dougherty, M., Kong, Y., Tse, W., Valeriy Shubinets, Michael Grimaldi, & Liao, E. C. (2013). Requirement for frzb and fzd7a in cranial neural crest convergence and extension mechanisms during zebrafish palate and jaw morphogenesis. Developmental biology, 381(2), 423-433. LeCorgne H, Tudosie AM, Lavik K, Su R, Becker KN, Moore S, Walia Y, Wisner A, Koehler D, Alberts AS, Williams FE and Eisenmann KM (2018) Differential Toxicity of mDia Formin-Directed Functional Agonists and Antagonists in Developing Zebrafish. Front. Pharmacol. 9:340. doi: 10.3389/fphar.2018.00340. Schonthaler, H. B., Franz-Odendaal, T. A., Hodel, C., Gehring, I., Geisler, R., Schwarz, H., & Dahm, R. (2010). The zebrafish mutant bumper shows a hyperproliferation of lens epithelial cells and fibre cell degeneration leading to functional blindness. Mechanisms of development, 127(3-4), 203-219. Neuhauss, S. C., Solnica-Krezel, L., Schier, A. F., Zwartkruis, F., Stemple, D. L., Malicki, J., Salim Abdelilah, D. Y. Stainier, & Driever, W. (1996). Mutations affecting craniofacial development in zebrafish. Development, 123(1), 357-367. Piotrowski, T., Schilling, T.F., Brand, M., Jiang, Y.J., Heisenberg, C.P., Beuchle, D., Grandel, H., Van Eeden, F.J., Furutani-Seiki, M., Granato, M. and Haffter, P., (1996). Jaw and branchial arch mutants in zebrafish II: anterior arches and cartilage differentiation. Development, 123(1), 345-356. Yan, Y.L., Miller, C.T., Nissen, R., Singer, A., Liu, D., Kirn, A., Draper, B., Willoughby, J., Morcos, P.A., Amsterdam, A. and Chung, B.C. (2002). A zebrafish sox9 gene required for cartilage morphogenesis. Development, 129(21), 5065-5079. Dee, C. T., Szymoniuk, C. R., Mills, P. E., & Takahashi, T. (2012). Defective neural crest migration revealed by a Zebrafish model of Alx1-related frontonasal dysplasia. Human molecular genetics, 22(2), 239-251. He H, Wang C, Tang Q, Yang F, Xu Y. Elucidation of possible molecular mechanisms underlying the estrogen-induced disruption of cartilage development in zebrafish larvae. Toxicol Lett. 2018 Jun 1;289:22-27. doi: 10.1016/j.toxlet.2018.02.023. Benjamin S Walker, Alexander G Kramer, and Christopher S Lassiter (2018) Atrazine affects craniofacial chondrogenesis and axial skeleton mineralization in zebrafish (Danio rerio) . Toxicology and Industrial Health. Vol 34, Issue 5, pp. 329 ? 338. Moreman, J., Lee, O., Trznadel, M., David, A., Kudoh, T., & Tyler, C. R. (2017). Acute Toxicity, Teratogenic, and Estrogenic Effects of Bisphenol A and Its Alternative Replacements Bisphenol S, Bisphenol F, and Bisphenol AF in Zebrafish Embryo-Larvae. Environmental science & technology, 51(21), 12796-12805. Meredith, A. N., Harper, B., & Harper, S. L. (2016). 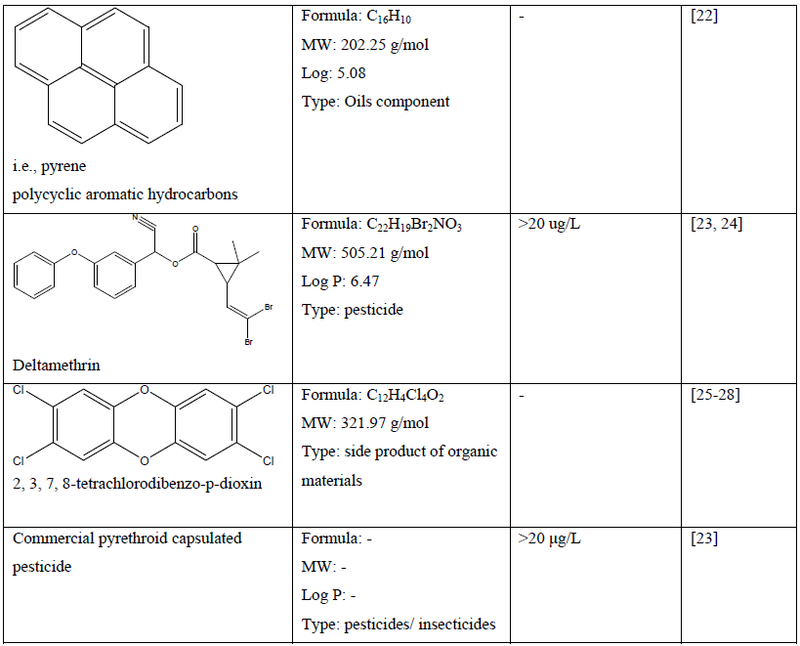 The influence of size on the toxicity of an encapsulated pesticide: a comparison of micron-and nano-sized capsules. Environment international, 86, 68-74. Zoupa, M., & Machera, K. (2017). Zebrafish as an Alternative Vertebrate Model for Investigating Developmental Toxicity?The Triadimefon Example. International journal of molecular sciences, 18(4), 817. Tse, W. K. F. (2017). Importance of deubiquitinases in zebrafish craniofacial development. Biochemical and biophysical research communications, 487(4), 813-819. Sharma, D., & Ansari, B. (2010). Effect of the synthetic pyrethroid Deltamethrin and the neem-based pesticide Achook on the reproductive ability of zebrafish, Danio rerio (Cyprinidae). Archives of Polish Fisheries, 18(3), 157-161. Liu X, Zhang Q, Li S, Mi P, Chen D, Zhao X, Feng X. (2018). Developmental toxicity and neurotoxicity of synthetic organic insecticides in zebrafish (Danio rerio): A comparative study of deltamethrin, acephate, and thiamethoxam. Chemosphere. 199:16-25. doi: 10.1016/j.chemosphere.2018.01.176. Menegola, E., Broccia, M. L., Di Renzo, F., & Giavini, E. (2006). Dysmorphogenic effects of some fungicides derived from the imidazole on rat embryos cultured in vitro. Reproductive Toxicology, 21(1), 74-82. Groppelli, S., Pennati, R., De Bernardi, F., Menegola, E., Giavini, E., & Sotgia, C. (2005). Teratogenic effects of two antifungal triazoles, triadimefon and triadimenol, on Xenopus laevis development: craniofacial defects. Aquatic toxicology, 73(4), 370-381. Arnold, M. C., Forte, J. E., Osterberg, J. S., & Di Giulio, R. T. (2016). Antioxidant rescue of selenomethionine-induced teratogenesis in zebrafish embryos. Archives of environmental contamination and toxicology, 70(2), 311-320. Yekti, A. P. A., Hsu, H. J., & Wang, W. D. (2014). The effect of paclobutrazol on the development of zebrafish (Danio rerio) embryos. Zebrafish, 11(1), 1-9. Planchart, A., & Mattingly, C. J. (2010). 2, 3, 7, 8-Tetrachlorodibenzo-p-dioxin upregulates FoxQ1b in zebrafish jaw primordium. Chemical research in toxicology, 23(3), 480-487. King Heiden, T. C., Spitsbergen, J., Heideman, W., & Peterson, R. E. (2009). Persistent adverse effects on health and reproduction caused by exposure of zebrafish to 2, 3, 7, 8-tetrachlorodibenzo-p-dioxin during early development and gonad differentiation. Toxicological Sciences, 109(1), 75-87. Carney, S. A., Peterson, R. E., & Heideman, W. (2004). 2, 3, 7, 8-Tetrachlorodibenzo-p-dioxin activation of the aryl hydrocarbon receptor/aryl hydrocarbon receptor nuclear translocator pathway causes developmental toxicity through a CYP1A-independent mechanism in zebrafish. 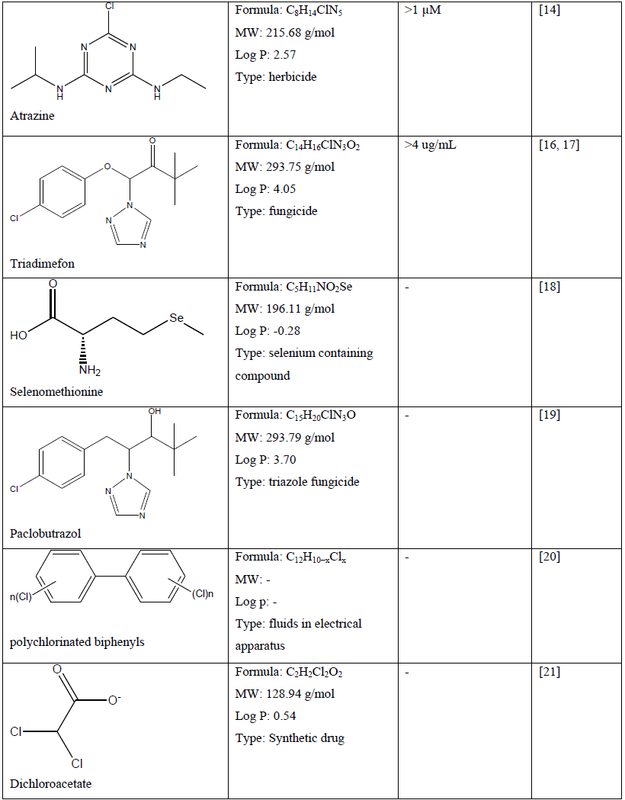 Molecular pharmacology, 66(3), 512-521. Henry, T. R., Spitsbergen, J. M., Hornung, M. W., Abnet, C. C., & Peterson, R. E. (1997). Early life stage toxicity of 2, 3, 7, 8-tetrachlorodibenzo-p-dioxin in zebrafish (Danio rerio). Toxicology and applied pharmacology, 142(1), 56-68. Burns, F. R., Peterson, R. E., & Heideman, W. (2015). Dioxin disrupts cranial cartilage and dermal bone development in zebrafish larvae. Aquatic Toxicology, 164, 52-60. ?i?man, T., Geyiko?lu, F., & Atamanalp, M. (2007). Early life-stage toxicity in zebrafish (Danio rerio) following embryonal exposure to selected polychlorinated biphenyls. Toxicology and industrial health, 23(9), 529-536. Hassoun, E., Kariya, C., & Williams, F. E. (2005). Dichloroacetate?induced developmental toxicity and production of reactive oxygen species in zebrafish embryos. Journal of biochemical and molecular toxicology, 19(1), 52-58. Incardona, J. P., Collier, T. K., & Scholz, N. L. (2004). Defects in cardiac function precede morphological abnormalities in fish embryos exposed to polycyclic aromatic hydrocarbons. Toxicology and applied pharmacology, 196(2), 191-205. Garcia, G. R., Goodale, B. C., Wiley, M. W., La Du, J. K., Hendrix, D. A., & Tanguay, R. L. (2017). In vivo characterization of an AHR-dependent long non-coding RNA required for proper Sox9b expression. Molecular pharmacology, mol-117. Truong, L., Gonnerman, G., Simonich, M. T., & Tanguay, R. L. (2016). Assessment of the developmental and neurotoxicity of the mosquito control larvicide, pyriproxyfen, using embryonic zebrafish. Environmental pollution, 218, 1089-1093. Keshari, V., Adeeb, B., Simmons, A. E., Simmons, T. W., & Diep, C. Q. (2016). Zebrafish as a model to assess the teratogenic potential of nitrite. Journal of visualized experiments: JoVE, (108). Macaulay, L. J., Chen, A., Rock, K. D., Dishaw, L. V., Dong, W., Hinton, D. E., & Stapleton, H. M. (2015). Developmental toxicity of the PBDE metabolite 6-OH-BDE-47 in zebrafish and the potential role of thyroid receptor ?. Aquatic Toxicology, 168, 38-47. Félix, L. M., Serafim, C., Martins, M. J., Valentim, A. M., Antunes, L. M., Matos, M., & Coimbra, A. M. (2017). Morphological and behavioral responses of zebrafish after 24 h of ketamine embryonic exposure. Toxicology and applied pharmacology, 321, 27-36. Lai, Y. H., Ding, Y. J., Moses, D., & Chen, Y. H. (2017). Teratogenic Effects of Topiramate in a Zebrafish Model. International Journal of Molecular Sciences, 18(8), 1721. Fetter, E., Baldauf, L., Da Fonte, D. F., Ortmann, J., & Scholz, S. (2015). Comparative analysis of goitrogenic effects of phenylthiourea and methimazole in zebrafish embryos. Reproductive Toxicology, 57, 10-20. Muralidharan, P., Sarmah, S., & Marrs, J. A. (2015). Zebrafish retinal defects induced by ethanol exposure are rescued by retinoic acid and folic acid supplement. Alcohol, 49(2), 149-163. Citation: Ahmad Firdaus B Lajis. Effect of Chemical Pollutants on Craniofacial Development of a Zebrafish Embryo. Journal of Bioinformatics and Systems Biology 1 (2018): 001-010.